How does an ear thermometer read body temperature? An ear thermometer reads the spectrum of thermal radiation given off by the inner surfaces of a person’s ear. All objects give off thermal radiation (including the light emitted by a glowing incandescent light bulb) and that radiation is characteristic of their temperatures. The hotter an object is, the brighter its thermal radiation and the more that radiation shifts toward shorter wavelengths. The thermal radiation from a person’s ear is in the invisible infrared portion of the light spectrum, which is why you can’t see people glow. But the ear thermometer can see this infrared light and it uses the light to determine the ear’s temperature. The thermometer’s thermal radiation sensor is very fast, so it can measure a person’s body temperature in just a few minutes. 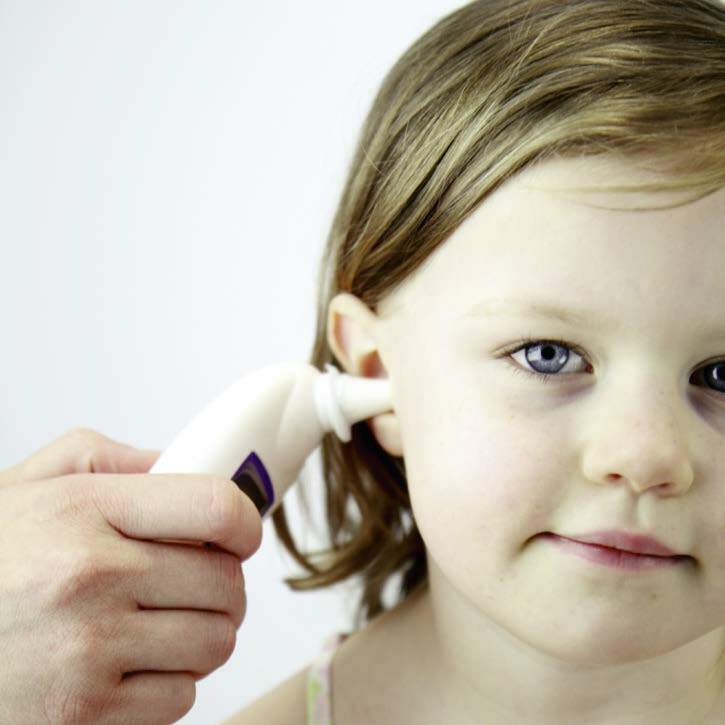 Ear thermometers, unlike other thermometers, read body temperature by detecting invisible infrared light.